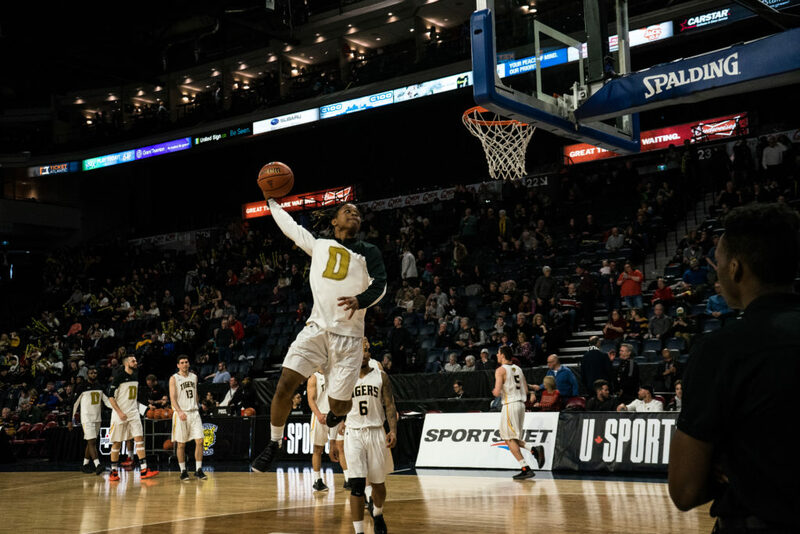 The Dalhousie men’s basketball team hit a major growth spurt between Jan. 26 to March 10 –– going from a good basketball team in the Atlantic region to a national championship contender. 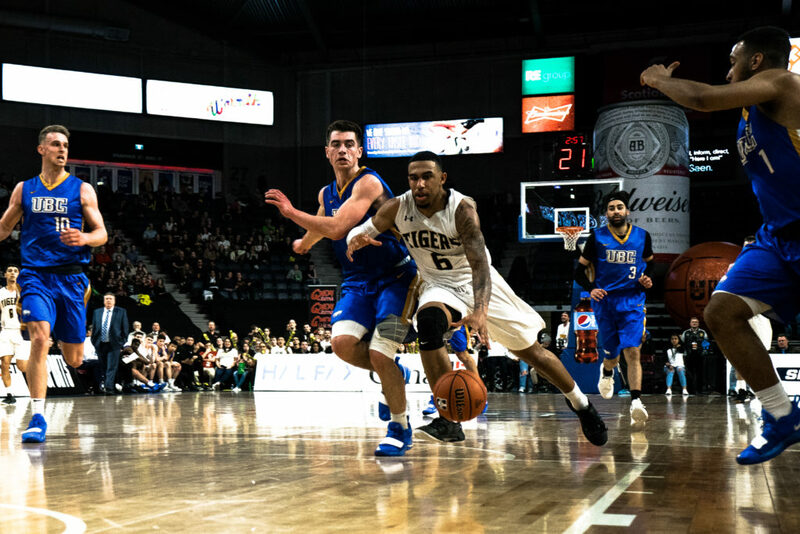 On Jan. 20 Dal had a record of six wins and six losses in Atlantic University Sport, it was a mediocre record and not one they wanted as hosts of the national championships. Then they went on a fantastic run, winning 12 straight games capturing the AUS championship and losing in bronze medal game at nationals. For a team with most players being before their fourth year, it was a big jump for the program. “We have grown a lot and what is really good about it is we lose three players, and so we’re coming back with the same core, so we’re expecting to make even more damage than we did this year,” said second-year player Keevan Veinot. Veinot is one of three second-year point guards on the team along with Xavier Ochu and Jordan Brathwaite. Those three were critical to the turnaround of the team. Point guards control the offence, they bring the ball up the floor, call the plays, and make the first offensive play with the ball. Their decision-making is crucial. As second-years, the young trio had some growing pains in the first half of the year about knowing when to make the right play. Veinot played only one game in January and was out because of tonsillitis, that meant Ochu and Brathwaite got more playing time and experience. By the time Veinot came back at the beginning of February, everything had clicked. All the guards felt confident, so they were playing better offensively. When they were losing, Dal only scored above 70 points once and only once they were unable to hold the opposition to under 76 points. Their defence was always great, but everything came together once the offence got going. “Keevan, Xavier and Jordan, they’re going to be scary,” says Plato. In the AUS playoffs, Dal defeated Memorial University and the University of New Brunswick in their first two games. They came up against the juggernaut Saint Mary’s Huskies in the championship game-SMU only lost one game all year. Still, Dal defeated them 65-55 and won their fourth AUS championship in five years. Veinot was named playoff MVP. Plato thinks Veinot has developed into a leader on the team. “I think [Veinot] started to realize his teammates looked up to him,” said Plato. “You need someone to drive the bus, everybody just can’t be along for the ride, somebody has to take the bull by the horns,” said Plato. The next weekend was the national championships. Dal’s first game was against the University of British Columbia, and Dal defeated them 74-65. Dal’s next game was against the top-ranked Carleton Ravens. Dal played great and was leading by three points heading into the fourth quarter. However, Carleton took control and won by 11 points. They played Ryerson for the bronze medal game but lost 84-66, by that time they had nothing left. Dal is losing Cedric Sanogo, Kevin Duong and Mike Shoveller. Sanogo was the only starter, so the young core is still intact. With the maturing of the guards and forwards Alex Carson and Sascha Kappos having another year of experience as the top scorers on the team. Dal should be a powerhouse next year, and Plato expects them to get to the national championship game soon. “We’ll be there, it just a matter of time with this young team,” said Plato.